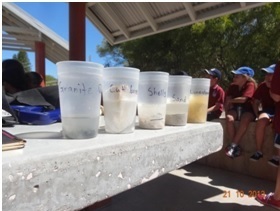 Sandwatch in Australia has been championed by Coastcare, Perth Region, hosted by the town of Kwinana. June 2014: ​Creature feature activity at South Coogee beach - to collect and identify plants and animals at the beach and to find out how changes to the environment may affect the food chain. See article on this activity. October 2013: Exploring ocean acidification through Sandwatch. Students at Coogee beach collect sediment samples from the beach and conduct experiments to measure the effects of ocean acidification. See article on this activity and the results of the field monitoring of acidification, beach width and marine debris. October 2013: Schools from Australia and Kiribati link together. South Coogee Primary School in Perth, Australia is linking with Moroni High School, Tarawa, Kiribati to share information, culture and experiences relating to the coast. Sharing information from the Indian Ocean to the Pacific Ocean enhances the students understanding of the coast and the issues that they face under a changing climate. See poster presentation at the Western Australia State Coastal Conference “Balancing Communities and Coasts." May 2013: Dune rehabilitation workshop attended to learn about project planning, sand dune structure, coastal processes, erosion control techniques, fencing methods, weed control, native plant selection, seed collection and monitoring. See article on this activity. July 2011: Students plant coastal species to stabilise the sand dunes at Coogee Beach. See article on the activity. April 2011: ​Visit by students of South Coogee Primary school to Coogee Beach to start Sandwatch monitoring activities. See article on the activity.